I call this recipe Miracle Hair Mask because it helps with so many hair issues. It’s also one of the most popular hair masks with the Indian women, because of its amazing beauty and healing effects. Helps prevent hair thinning that occurs due to menopause. The good thing about the Miracle Hair Mask is that it works for all hair types: whether your hair is dry or oily, fine or coarse, frizzy or damaged – everyone can use it. 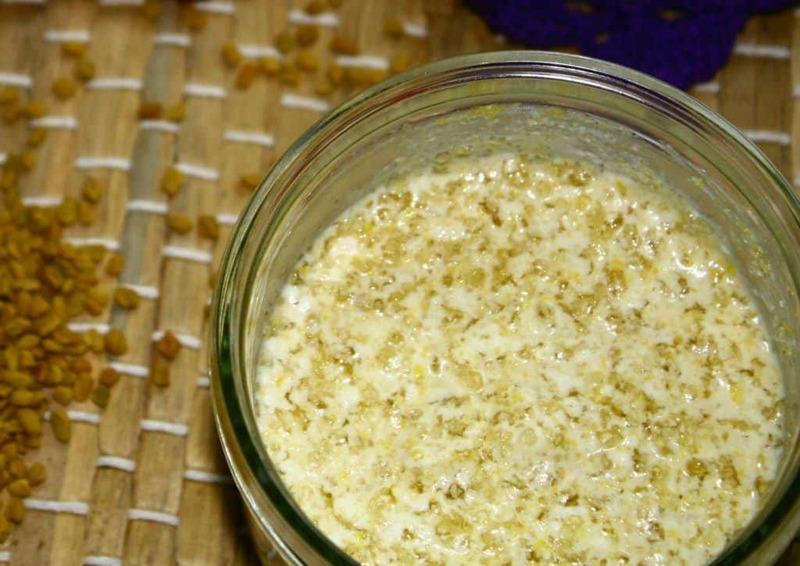 Made with just two ingredients – Yogurt and Fenugreek (methi) seeds – this mask will transform your hair into fabulousness. You will find fenugreek or methi seeds in every Indian, Bangladeshi, Pakistani and Sri Lankan kitchen. It’s not just an aromatic spice, but has amazing medicinal and beauty benefits. Fenugreek is an age-old remedy for hair loss and thinning. It stimulates blood flow to the scalp, nourishes the hair follicles to promote faster and healthier new growth. Fenugreek is also a great alternative to store bought conditioner, thanks to its high mucilage content – which provides slip like conditioner and makes detangling very easy. And if you have dry, coarse or frizzy hair, fenugreek can come to your rescue. Regular use of this herb in a hair mask or deep conditioner will naturally soften your hair, increase manageability, and restore lustre and bounce. In addition, fenugreek contains antioxidant and anti-inflammatory properties that help with dandruff, scalp irritation and acne. Also, if you are losing hair due to menopause, I highly recommend this mask for you. Fenugreek is high in plant estrogens and thus will help prevent thinning hair that occurs due to menopause. Yogurt is wonderful for hair. It is full of protein, which works to strengthen the hair shaft, thus preventing split ends and breakage. At the same time, yogurt also conditions, moisturises, and adds volume and shine to your hair. And if you are struggling with never ending dandruff, the combination of yogurt and fenugreek is excellent. Yogurt contains healthy bacteria that help to fight dandruff causing yeast. Also, the lactic acid in the yogurt has gentle exfoliating action. It will get rid of dead skin and flakes and promote clean and healthy scalp. If you think the mixture is too thick to apply, add a few tablespoons of water to make the mixture more creamy. After 2 to 3 hours the mixture will thicken up. Mix once again and use. Fenugreek seed powder: You can buy fenugreek seed powder from an Indian shop or online. 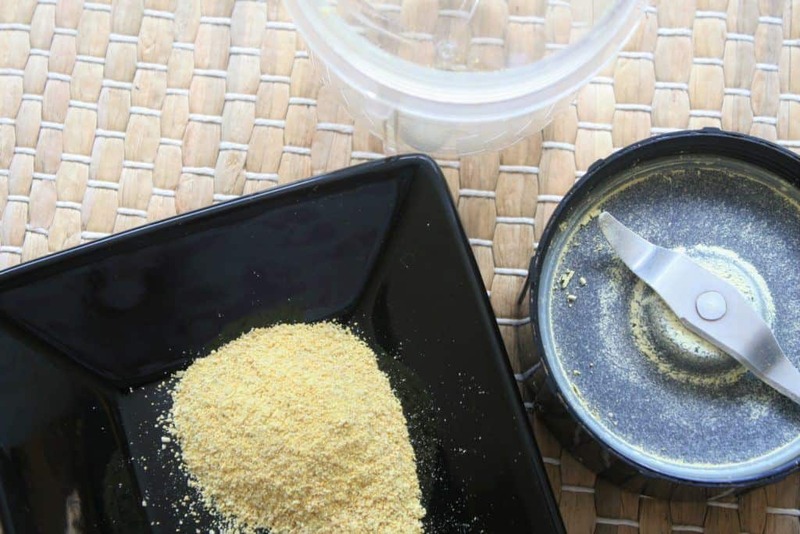 But you can also easily make your own fenugreek seed powder. All you need is fenugreek seeds and spice and nut grinder. Just add 1 tbsp fenugreek seeds and grind to a fine powder. You can also grind large qualities and store in a glass jar. Fenugreek smell: Fenugreek has a nice pungent smell, but some people find it strong. To lighten the smells you can do the following: Heat a pan until warm, add the seeds and roast over a medium flame, for a couple of minutes, stirring constantly to avoid charring. Using yogurt: For this mask it’s best to use plain, whole fat yogurt. Also, prefer yogurt with live cultures, as it has extra benefit for the scalp health. If you make it at home, that is the best. Yogurt substitute: If you are a vegan or don’t like putting yogurt on your hair, you can replace it with coconut milk. It offers similar hair benefits as yogurt. Also, yogurt may cause drag or roughness in some people’s hair, so for them coconut milk is a good option. Have you tried this hair mask? I am excited to hear how it works for you….Share your experience/views in comment box below. A big shout for Minaz….who helped me..during my bad hair days…2years back I shifted to holland from India..that time I m loosing hair due to lack of ferritin, calcium and biotin deficiency..I send her a mail and she suggest me that yogurt and fenugreek hair mask..That mask really suits on my hair..gradually I made a regular hair care routine…Thank You Minaz…. Alright!!! This is my Story and the reason i am writing it is because I CAN’T BELIEVE THAT THE ANSWER TO A CURE FOR TOTALLY DAMAGED HAIR DOES NOT REQUIRE ANYBODY TO SPEND THOUSANDS AND THOUSANDS OF RUPEES AT PLACES LIKE KAYA OR THE SIMILAR SORTS WHO ARE PROBABLY LOOTING PEOPLE. A scalp rejuvenation therapy at a renowned skin center costs about 70, 000 and i was worried because i did want to regain the luster and beauty of my hair but cold not afford so much for it. Like i said, long before that i am very fortunate to have encountered Hair Buddha. I am so very happy to see my hair recovering and can’t believe that this could be so simple and all within a few rupees. I used the COCONUT MILK & METHI therapy for dandruff & hair fall and after so many YEARS, i can actually feel my hair to be softer than before. I guess the miracle here is the COCONUT MILK. Very few are aware of the fact that COCONUT OIL has reverse affects on damaged and dry hair, like i did and so I could never bring the softness back to my hair but COCONUT MILK is SIMPLY AMAZING and i recommend this to everyone. Thank you HAIR BUDDHA and THANK YOU MINAZ….!!!! I mean every bit of what i said. Hi, Can I use green tea shampoo After oiling my hair? I live in India and I have been struggling with androgenic alopecia for the past fifteen years. I have been using 2% minoxidal solution too which has helped me solve my problem to an extent. However, currently I have moved to a place that has hard water because of which, I am experiencing acute hairfall. Please suggest some home remedies to me for hair regrowth and for treating alopecia. You can boil whole shikakai in water for 5 minutes. Let it cool, then add a tablespoon of honey and use that to wash your hair. I have very fine and dull hairs, and am struggling with a lot of dandruff problem. I have applied coconut oil with camphor, Can I apply this mask after that? Karishma, skip camphor, use coconut oil and lime juice, followed by the mask. I’m from Pakistan. My prob is that i have very thin, dead and dry hair for almost 10 to 11 years. After shampooing they become rough, dead and dry no matter which shampoo I am using. I have used almost every shampoo but nothing worked for me. Before that in my school days I had good, straight, shinny black hair. I have tried many totka, tips and diet but nothing helped. Please suggest something so that I can have good hairs again. Hi Maha, This is my favourite homemade shampoo. Add some fenugreek seeds to it. Will defo going to give this ree-shi shampoo a try. Another problem is that, I have very few hair on my head.. like I can’t open them in front of anyone nor I attend events because of then. Literally I have 2 to 3 strands. Kindly tell me something so that I can have healthy and thick hair. In chilhood i have good hairs not so thick but even, shinny and smooth. I will say have patience. The more you stress, the more it will take time for your hair to come back. Be confident and live a normal life. Thanks Minaz for this hair growth recipe. I have what is referred to as 4c (Don’t know where that coinage came from) hair texture (afro). I can boastfully say that using this recipe has help me regain lost hair. I love, love the bounce it gives to my hair each time. Can you please tell me. Is it also effective for premature greying of hair? Hy mam..I have fine and dry hair…nothing suits me..so can i leave this miracle hair mask for 2 hrs on my hair..suggest some tips for hair thickening.. Yes you can, you can also try egg hair mask. I have a question maybe somebody can solve for me. Everytime I scratch my scalp there is like a brownish waxy substance in my nails, what causes this? Very embarrassing and I have a lot of hair loss mostly on top of my scalp and crown area. Could you please help me bc I don’t want to keep wearing a hat and don’t feel like wearing a wig. Your input would be greatly appreciated. I wanda, you need a good cleansing mask: try this one. It will also help with hair regrowth. Every day oil massage is good for hair? Oil massage once a week. Rest of the days you can simply massage, without oil, using just your fingers. Dear Karen, they both are same. I just wanted to give an update of my experience with this mask. So far i have tried it about 3 or 4 times using argon oil and I have to say I love it. It is a little messy to apply but I love the smell and if you add a bit of water it goes on much easier and the moment I feel the mix touch my scalp, it rejoices. It is really a nice, soothing feeling each time, telling me it is probably what my scalp has been craving. Not to mention my hands feel nice and soft when I wash them after application. It is not the easiest to wash out as there are lots of little bits from the fenugreek but it is not too difficult and with a little patience it will come. In the end, when my hair has dried it is soft and voluminous and my scalp clear of flake, which is a better result than when I last used coconut oil, which has been my remedy for years for my fickle little scalp that loves to flake. I can’t comment on the long term affects yet, I am not sure if I am growing more hair or not, I don’t think I have an issue with hair loss but my hair is fine and delicate and i’d like to grow it long, which is why I decided to try the mask. I can say however, that the baby hairs around my hairline seem to be getting a bit uncontrollable which makes me think there are more (usually they don’t stand out much, if at all). So, with that said, I am now out of argon oil but have an abundance of other oils such as jojoba, rosehip, ylangylang, and sweet almond. Can I use any of these as a substitute? Hello Imari, So happy to hear you love this mask and thanks for sharing your detailed feedback. It will be very useful to other readers. You can use almond oil and note down your experience and compare it with the other oils. That way to can shortlist what oils work best for your hair. It’s very easy to forget few months down the line, so writing down helps. We actually have extraordinary ingredients in our own kitchen, it’s a matter of knowing how to use what. Can I use honey or eggs in this pack to achieve greater softness? P.S. I am going to use this pack for the first time today! I’ve been so excited to look through your website as I am trying to switch to all natural shampoos and dandruff treatments. I tried this mask but it made my hair feel really dry and coarse and it was frizzy and hard to detangle afterwards. I used the first three ingredients plus the shikakai. Could I have left it on too long or is there some reason you can think of that might cause this reaction. I also came by your post because coconut oil hasn’t worked for me and caused about the same result. Hi Ariel, try just yogurt and fenugreek. If it still doesn’t work use this mask. I love all your posts , they are amazing and extremely helpful . I have been struggling with terrible hair fall and hair damage post my delivery and the change in country of residence which has reduced my hair to almost half the density of what was before. I luckily chanced upon Hair Buddha and the miracle hair mask which has done wonders to my hair by bringing back the softness and reducing hair fall to some extent. I still have some amount of hair fall every time I comb, but I am still satisfied with the results from the miracle hair mask. All thanks to you Minaz! Are there any more suggestions to strengthen my hair along with hair regrowth. I have been struggling with horrible dandruff and an itchy scalp since last May. I’ve tried every type of shampoo and conditioner there is including some very expensive ones. The yogurt, fenugreek powder and olive oil mask seems to be soothing to my scalp. I’ve done two weekly treatments so far and it feels better immediately. Any other tips? I have plenty of fennel seeds, but not fenugreek. Is it okay to substitute fennel seeds in this recipe? I did a little research and it seems fennel seeds have similar healing properties but thought to find out from the expert! Hi Jenn, you are right in saying that fennel and fenugreek have similar properties. Both contain plant derived estrogen which is really beneficial for hair. 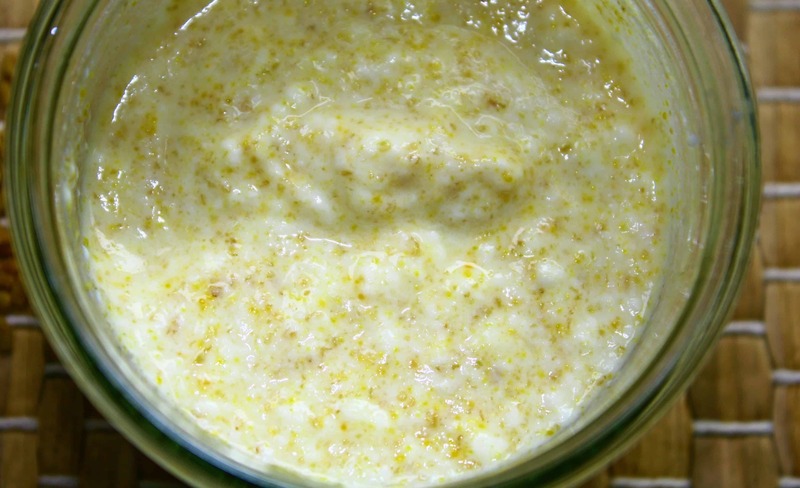 Fennel would be useful if you eat it, but not with yogurt, as it lacks the mucilage. Hi, I washed my hair with shikakai powder and coconut milk.My hair got very dry and also hair loss is massive. I was trying this to help with hair loss but now it;s more. May be did something wrong. Same with my 13 yr old daughter. Poor girl is losing much hair. She has very fine and dense hair and the powder seems to have settled around the roots and in scalp. Is there way to clean the scalp to get rid of the powder and may be dandruff due to this powder. would yogurt help in taking out shikakai powders from scalp. She has very dry hair. TIA. Helle Minaz, Iam a 59 year old Woman who has natural thin straight to wave hair. I don’t use any hash chemicals at all. I stopped long time ago because of my hair texture and I just knew that dyes weren’t really good for my hair. Around my edges I notice for years was thinning out I think from pulling my hair up and back tightly when I was young started it. I have been going natural with all shampoos home made as well as conditioners, using Apple Cider Vinegar rinses etc. My goal is the health, and growth of my hair thats it. I do realize that my hair is thin has always been thin from a child so I know it won’t grow in thick but, it can be healthy and long applying the right treatments to encourage growth. I am interested in your opinion on how I should use Fungreek powder, or any other Treatment you can suggest would be appreciated. Hello Mrs Shelle, use the fenugreek seed and yogurt as I have mentioned above. Fenugreek seeds are particularly useful for your age as the contain phytoestrogen, which helps to keep hair strong, healthy and nourished. If you can, include healthy fats such as flax seeds, almonds and ghee in your diet. I like the idea of yoghurt and methi hair conditioner. Can it be preserved? If so, how long for? I am work long hours as part of a nursing team hence time is limited. I have only recently experienced hair loss around my hairline so looking at natural products to regrow them. Your website is great, thanks for the many tips and ideas. I am glad to know you are finding the natural tips and ideas useful. No it can’t be preserved. Just plan it ahead and keep the methi powder ready. Can i use greek yoghurt the plain(unflavoured, unsweetened) one? I have tried amla, ritha, shikakai mask before, it works great for any hair problem, expect it colors them to black, I had brown hair with little golden touch naturally and it turned them near to black, also that mask is runny, so I had to stop it, though I have never tried mixing yogurt and fenugreek to it, so will adding amla in this mask again turn my hair to black?? Yes amla can darken your hair, skip it. Hi minaz…happy to see your website. Everything needed under one roof. Thank you so much for all ur tips. I wanted to try the miracle mask. But was wondering if I can do it after the oil massage that you have suggested in the other post? Hi Pavithra, yes you can. Can we apply this miracle hair mark after massaging the hair with oil? Hi Donnamarie, that’s a great tip to cover grey hair. Thanks for sharing! Let us know how it works for you in the long run. Hi Minaz.. is there a way to remove waves in the hair because of hard water build up. My hair have formed waves in specific sections because of the build up. Chelating shampoo is not helping to straighten it back. I’ve tried curd and coconut milk and egg…also reetha shikakai shampoo.. it appears to make the hair shinier.. but still not able to recover the straight look..any treatment which can help over a period of time? I’ve always had naturally straight hair.. right now also waves are only in the area of build up. Hi Aastha, use milk and honey hair mask. It works great to naturally straighten the hair. Hi Aastha, use lime juice/apple juice hair rinse to clarify. Am in Kenya East Africa .how can my hair grow long n stop breaking? Hi Aastha, I highly recommend you try miracle hair mask or egg and olive oil hair mask. I make my homemade shampoo with more shikakai, and a couple of reetha. I also add some methi dana to the shampoo. Or I have some shampoos suggestions on the resource page. Have a look. Hello! This information seems very useful and I can’t wait to try this out. I have a few questions: When you say “set aside of 2 to 3 hours” are we supposed to be setting it aside in the fridge for those 2 to 3 hours or just at room tempeture? Just wondering since perishable yogurt is being used in the recipe. Also if I wanted to apply this to clean hair after I shampoo as a deep conditioning mask would it be ok to sit under a hooded dryer for about 30 mins with a plastic cap then when finished use a cowash or normal conditioner to wash the mask out? I have tried this mask twice so far. It is really good and I am hoping that all my hair problems will reduce slowly. But the mask leaves small fenugreek particles in hair after washing with a shampoo. How to clean it properly? Grind the fenugreek seeds really fine. You can also sieve it. I have mixed reetha, shikakai, hibiscus, amla, neem powders. Is it ok to use this mixture for hair mask along with yoghurt, olive oil? sounds yummy can you eat it too? Or is this the recommended amount for one person? Hello, I was wondering do you have a recipe list for a big portion of this? Buy any extra virgin olive oil. Or you can use any of your favorite oil and that’s fine. Could you please suggest which brand for olive oil to use for hair? Since in the markets I see olive oils for cooking only. Hi Minaz..Thank you for this wonderful blog. My question is Can I add onion juice along with a few drops of lavender essential oil for this miracle hair mask for hair growth? Will it help or will it do any damage as there are lot of ingredients. Kindly suggest. Hi! Happy New Year! I was wondering… I have been using the Castor oil and Egg mask along with your Natural shampoo recipe, which also uses fenugreek seeds. So far I do like the results. I was wondering tho, would you recommend this mask over the Castor oil egg mask? Also, I was thinking of incorporating the Rosemary hair rinse after the Natural shampoo. As of right now, I can definitely see more growth and am experiencing less hair loss. I also use Henna, but either the Natural shampoo is helping with my grays or it may be growing slower, since we’re in winter now, but usually I have to apply Henna every 4 to 6 weeks. It has been over six weeks now and I don’t see a need for it yet! Again, thank you for such a great site!!! Hi Denice, A very happy new year to you. Thanks for sharing your results with natural shampoo and castor oil and egg hair mask. Every ones’s hair is different, so you will have to try this mask. Since you are already using fenugreek in the shampoo, it may not have an added advantage. But you never know, so give it a try. HELLO! great article, loving all info i can find here! Today i tried this hair mask but left my hair super dry -.-‘ i added the amla powder and actually i think it is because of it cos i used it before with the same drying effect. is that possible? cos i read in your posts the many benefits of amla so its weird it dries my hair so much! Hi Nina, try replacing yogurt with coconut milk. Skip amla. For dry hair you can also try one of these hair masks. Hello ~ If you use coconut milk instead of yogurt, how much should you use? Also, are you able to store this mix and if so, how long does it keep? Hi Minaj I had a few questions…first can you keep the mask on overnight? Second I suffer from eczema on my scalp will this mask be good for that?..and third can I use jojoba oil in the mixture instead of olive oil? Apply on a small area of scalp and see how it reacts. If your hair likes jojoba oil you can use that. Hi Minaz, there is another mask that promotes hair growth. Soak tender curry leaves, neem leaves, amla and shikakai overnight. h eat (not boil) this mix. Allow it to cool. Then strain and apply it on the hair and scalp. Leave on for 1-2 hours. Wash off with normal water. If one is not applying oil, this work as a wonderful cleanser too. It can be used every three to four days. In this way one can skip the use of a shampoo completely. But i must add that this mask does not clean oil. So if one has oiled the hair, it will first need to be shampooed before this mask is used. You might try getting your hormones tested, including your thyroid levels. Hi ! I am 15 yrs old and there’s a huge hair loss in front on my scalp since I was 13. I’ve seen very very thin hair follicles there that do not grow and repeatedly falls off. And I also have dandruff. Don’t know how to completely cure this. I know it will take time to cure this problem but I have no hurry. What I want is the results. Could you please help me ? You might want to see a doctor or naturopath to get your hormones tested. I hope you find the help you need! Hello! I tried this hair mask, first time after reading your post. My hair problems are very thin, dry, dandruff and hair loss. I applied this mask, 3 days back. Liked the fuller and strong feeling of hair. But faced the problem of fenugreek powder still sticked to hair (even after washing).So, have to wash second day. Also, we have very hard water for usage. I will try the mask and let you know the results. I could like to know, how much time it takes to show the results? Great, also try tips from how to stop hair loss. Use reetha shikakai rinse or any herbal rinse and it will come off easily. Awesome! Yes you can do this mask weekly. I just tried this mask about five days ago and it soothed my extremely flaky scalp so much that I couldn’t wait the full week before trying it again. thank you for sharing. 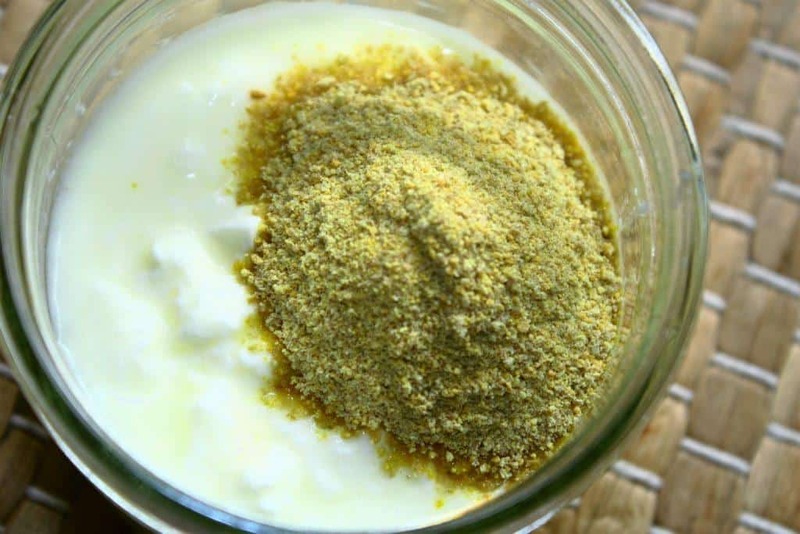 However could I ask one question, you mentioned in the comments that soaking the fenugreek powder helps to get rid of the smell, I did that today but I threw away the extra water (the fenugreek powder had thickened and sank to the bottom) and mixed the remaining powder with the yoghurt. is this correct? I am glad to know it helped your scalp. Don’t throw the water, take less water next time. Did you find any difference in the results using this method? Hi Sandhya, thanks for reading. Did the doctor do any blood test to rule out any deficiency? iron, b12, vitamin D, calcium are common ones that cause hair loss. Hey, Minaz! I’m from Russia, but I do really love Indian receipts for hair. I’m using it about more that few years already! Thank you so much for new information and inspiration! My question is how to avoid smell of fenugreek on my hair? It’s last for so long! And I smell like some meat dish!? Hi Amilina, I am so happy to hear that. To reduce the smell, add less fenugreek, and keep it on your hair for 15 minutes. 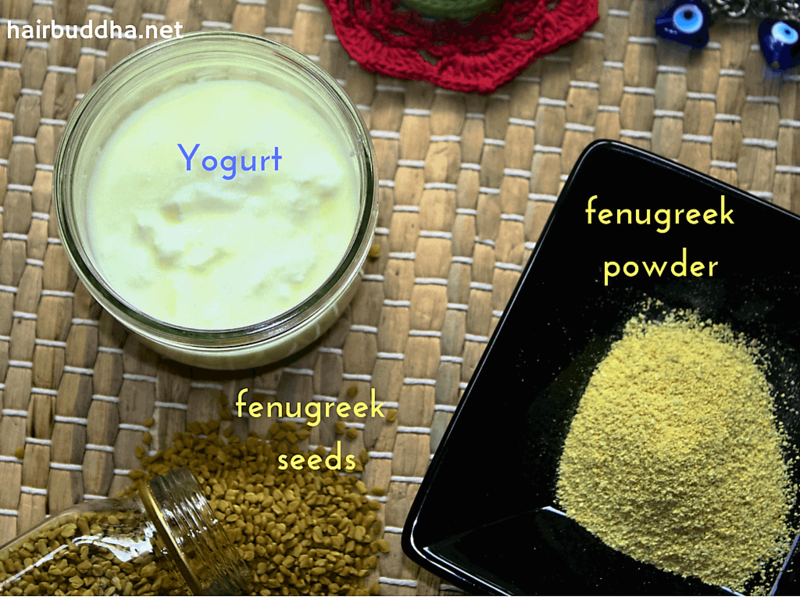 You can also presoak the fenugreek powder in water for few hours, then combine with yogurt and use. This will also cut down the smell. Thank you very much for so fast reply! I’ll try in few days and let you know. Love your website and appreciate that you share so much useful tips to us. Keep the love. I’m 33 yrs old and a mother of 2 kids(ages 7&2). I’d always had very thick and long hair(hip length) since childhood. I started losing hair very badly 3-4 yrs ago and now my hair is 1/3 of what I used to have before.Because of the extreme hair fall, I cut my hair to shoulder length. I went to a doc and he said that there is no new hair growth coming in so he suggested that i should vitamins and some biotin. So far I don’t see any change in the hair fall or new hair follicles growing. I want to know from you whether there is still a chance for me at this age to regrow new hair and get that thickness(volume) back if I try the your tips. Kindly reply. I started reading your website few days ago and love all the tips and information that you share. Keep the love of sharing going on. I want to know one thing. After rinsing this mask you have suggested to wash hair using a natural shampoo. Can I wash the hair using besan mixed with water or use shikakai powder dissolved in water. I am a bit skeptical here as to how will i wash my hair with a non store bought shampoo.?? Since your hair is dry, use shikakai powder or ree-shi shampoo. I will tell you one short cut that I do sometimes: I add a teaspoon of store bought shampoo (SLS and paraben free) to the homemade ree-shi shampoo and wash my hair with it. This helps to clean my hair beautifully. 2) Do tell me a good method to use the shikakai powder to wash my hair. Himalaya Herbals Baby Shampoo is a very mild shampoo, and SLS and paraben free. I know it sounds odd to use baby shampoo, but this one is really good. It doesn’t lather at all, and feels more like water than shampoo, but it cleans the hair well. 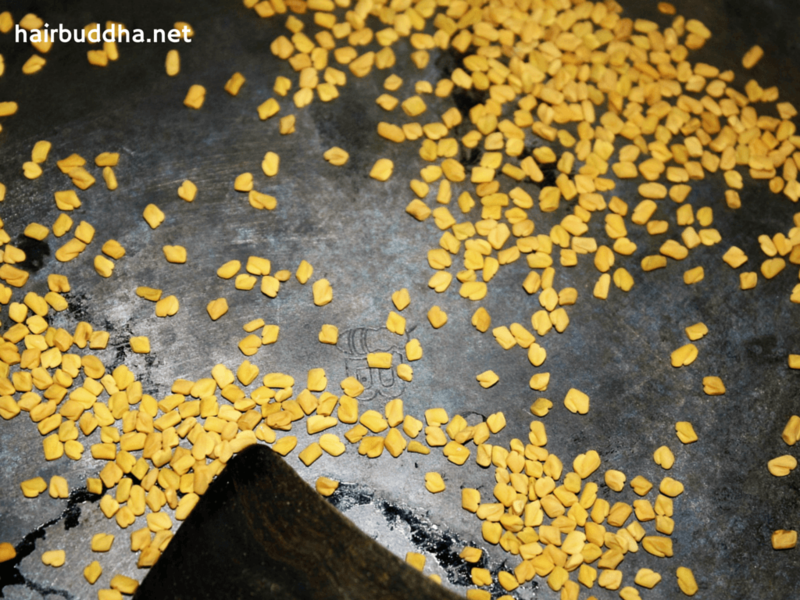 Are fenugreek leaves work for dandruff? I have heard that they do, but never tried them. Last question, I did this today and my hair was beautiful! Once I rinsed my hair, I got very defined curls without frizz!! I wanted to follow up with an amla powder & coconut oil treatment. My question – could I get rid of the coconut oil and instead add amla powder to this miracle (yes it is) mask? Is it okay to use greek yogurt for this recipe? 1. Can we use castor oil instead of olive? 2. Can we use the mask more than once a week? Will that provide more benefits? Once a week should be enough. You can try castor oil. What other oils can be used in this recipe? I don’t know what might be the reason but my hair has become wavy and it has recurring dandruff..
Do help me… Please ? What would you recomend to do on hot days, where the hair gets all sweaty? Don´t want to wash it everyday, but stilll don’t want to walk around with all sweaty hair! you can use rice water rinse, add a teaspoon of lemon peel powder and/or shikakai powder to it. Let me know how it goes. Tip: use the first, easy method to make rice water. Very detailed and nicely written article, would definitely like to try this hair pack. Thanks very much Minaz and all the best for you. Walter, I am so glad you liked it. Let me know how it goes for you. Hi, can this mask be used on colour-treated hair? I don’t have an experience on colored hair, but I have’t come across any one use this and change their hair colour. I have used yogurt many times just on its own for my dry hair and it really helps. Knew about health benefits of fenugreek as well. But never thought of using both together for hair. Brilliant! That’s why I love hairbuddha it’s become my default for any hair related issues. Thanks for what you do and the simplicity of ideas that you share. I am 44 and have had thick long hip length hair all my life. But my hair started falling drastically since last october and I consulted the dr. and got the blood work also done. Everything is fine. Dr. said it could be seasonal, and I too thought so initially But it is still falling(its been a year now) and I can feel my scalp now. Today I consulted a dermatologist and he has prescribed Performa spray 5%(Minoxil) and said that if i start using it, then I would have use it all my life. He says this problem is hereditary and would not fix itself. So, spray is necessary. I am scared to use it though. But I am also scared that I might get bald if i don’t use it. I have never done any styling, coloring, hair dryer.. always used coconut oil and regular shampoos and always kept my hair in a braid.